During periods of engine operation where manifold vacuum is high (idle or cruise at moderate speed), the tapered end of the valve will be pulled against spring pressure into contact with the valve body as shown in "partly closed". With the valve in this position, fumes from the crankcase are drawn through an orifice in the valve and into the intake manifold. The orifice is calibrated to allow sufficient flow to properly vent the crankcase but still not upset the idle characteristics of the engine. -A PCV system is not a bandage for an engine in poor condition with more than acceptable blowby. A draft tube works well in a motor in good condition. -If you do hook up a PCV valve from your Carburetor vacuum port to the valley cover or rocker cover, it still may not be a closed system. The breather/fill cap used on road vent systems should be vented to the air cleaner. This can be done more than one way. As shown above, in the nailhead closed system, the in air to the crankcase is filtered to prevent oil vapors from being sucked into the air filter housing during low or no vacuum periods. On later model engines, this filter is incorperated inside the air filter. It is not absolutely nessessary to close the system, you can simply use a vented filler cap for the air in. -The prefered location on a V-8 is refered to as a cross ventalation system where the air in from the air cleaner is located on one rocker cover and the air out (pcv) is located on the other rocker cover. -A good location on a straight 8 would be to adapt the pcv valve to the lifter cover where the draft tube was located. 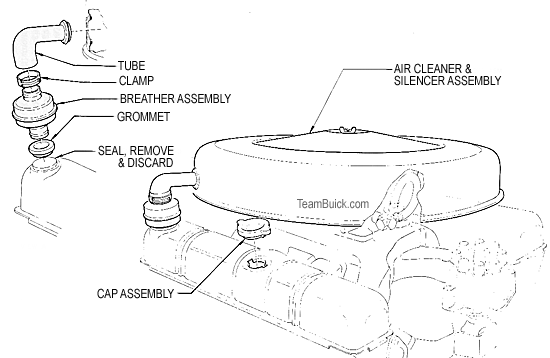 On other inline engines (not Buick), consider adapting to the location of the road draft tube. -When looking for a vacuum source to run the PCV hose, you will need a port with full manifold vacuum. The most common is the same port as may be used for your power brake booster.